Please see the Glen Echo Park Spring/Summer Catalog for details. 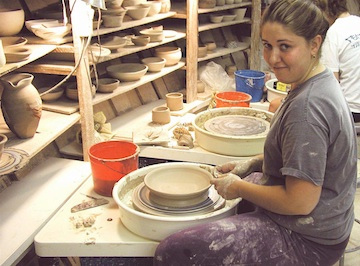 Class description: Our teen classes provide a basic introduction to the potters' wheel. We offer instruction on wheel throwing steps, surface treatments, and glazing techniques. We welcome students of all levels of ability and encourage free expression in both functional and non-functional ware. Note: We regret that we cannot offer open studio hours for teen wheel students. Tuition: The teen class tuition fee covers everything--class instruction, clay, tools and bisque and final firing of work produced during the session to cone 10 in a gas reduction kiln . Please see the Glen Echo Park web site for specific session listings and registration information. What to wear: Old clothing and sturdy shoes if you prefer to work on a kick-wheel. Make-up Classes: Students may “make-up” missed classes only during the current session for which they are registered. The instructor will assist any student who needs to re-schedule a missed class. A Special Note to Parents: Please pre-register your child in the desired session prior to the first class. We cannot allow unregistered students to participate in a class until they are fully registered. Please plan to drop off your child no earlier than 10 minutes before the start time of the class and pick your child up no later than 10 minutes after the closing time of the class. Since we have activities scheduled for every hour of the day, we have no way to accommodate students who arrive too early or stay too late. There are no suitable places in the Park for students to ‘hangout’ and wait (particularly in the winter or on rainy days), so we strongly encourage parents to be prompt. The Park's website (www.glenchopark.org) provides current class schedules (including the start and end dates of each (mostly 6 week) session, registration information, tuition fees, forms, and policies. You have the option to register on-line, by phone, by mail, or in person. You must be preregistered to attend our classes. To register for a class online go to http://www.glenechopark.org/ceramics-pottery-0.